Instant Messaging (IM) is an application that allows exchanging messages in near real-time between two users or more. These messages can be sent within the context of a call (in-dialog) or outside a call (out-of-dialog). There can be different applications like chat box app, even control signals can be exchanged among users. Session Initiation Protocol (SIP) already developed the fundamental framework for real-time communication that IM requires, RFC 3428 extends SIP with the MESSAGE method that allows the transfer of IMs. Since, the MESSAGE request is just an extension, it has all the built in routing and security features of SIP. It carries the content in the form of MIME body parts. Usually the MESSAGE method does not create a dialog, each IM stands alone like a pager message. However, different limitations of SIP MESSAGE method have been resolved in RFC 4975 known as Message Session Relay Protocol (MSRP). MSRP is especially useful if the contents are multimedia in nature. 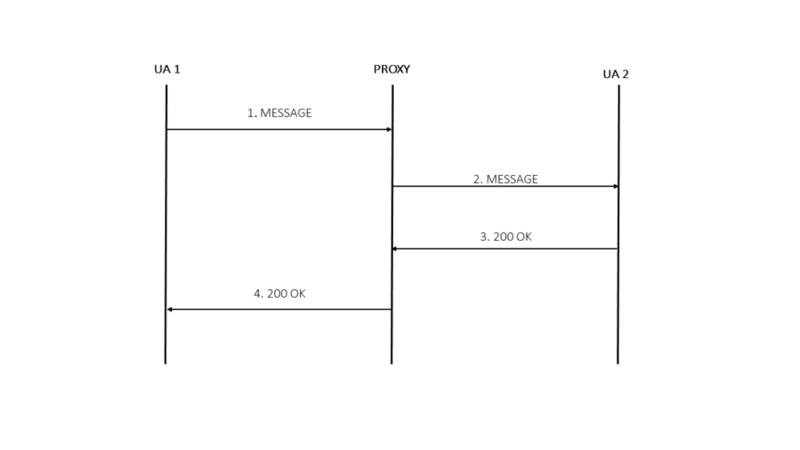 In the example message flow (RFC 3428), shown in the figure, an IM is sent from user agent 1 (UA1) to user agent 2 (UA 2) through s single proxy. This message when received by UA2, displayed and a response is generated and sent to the proxy. VOCAL Technologies has been in business for over 30 years and is an engineering design house that can provide a custom solution that meets your unique communication requirements. Please contact us to discuss your communication application requirements.